Welcome to restaurant Sjösidan at Ringsjöstrand. 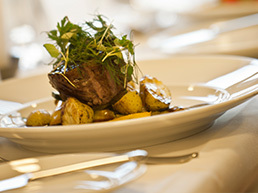 Welcome to a tranquil avenue with a delightful view of Ringsjön and an absolutely amazing culinary experience. 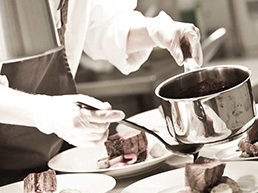 Our chefs provide simple yet exquisite workmanship in every dish. a kitchen with both local global produce. 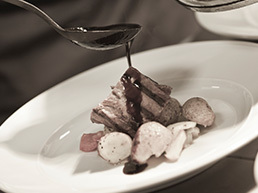 The chefs are constantly improving their craft and artistic view with every dish they make. We put a lot of effort in the search for food suppliers that provide our ingredients with the same love for quality as us. We do not compromise with our ingredients as our goals are to provide food that is of top notch quality. We do not do anything with out a reason, there not a pinch of spices or drop of butter or oil that is not a thing that is not purposely there. The restaurant has a full permit bar with a selection of locally brewed beers. For those of you who just love Great food and wish to get away from everything for a weekend will find us a perfect choice. 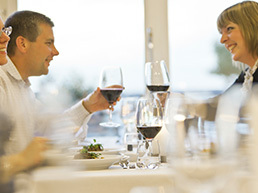 When you arrive on Saturday you get a welcoming drink and then can enjoy exquisite culinary delight in form of a four course dinner menu with our accompanying wine package of the house wines. During your stay you have free access to our Relax/spa with a Jacuzzi under the sun and Sauna. All to help you find your inner calm.